Unmanaged 5-Port Industrial Ethernet Switch with Din Rail Mount. Each port supports 10/100 Mbps speed auto negotiation and plug-and-play. Durable for harsh industrial environments and compact for use in control panels. Supports operating temperature -40 ~ +75°C (-40F ~ 167F). NS-205 is light and compact, din rail mountable and can easily fit in tight spaces in control panels. With the width of 1.3 inch (33 mm), it can save users a lot of space. The NS-205 is a compact, robust and durable 5-port industrial Ethernet switch. It has 5 Ethernet switching ports that support 10/100 Base-TX, with 10/100M auto-negotiation and an auto MDI/MDI-X function. It is very easy to use with plug-and-play. Through its 5 ports it can connect with 5 workstations and automatically switch the transmission speed (10 Mbps or 100 Mbps) for corresponding connections. The flow control mechanism is also negotiated. 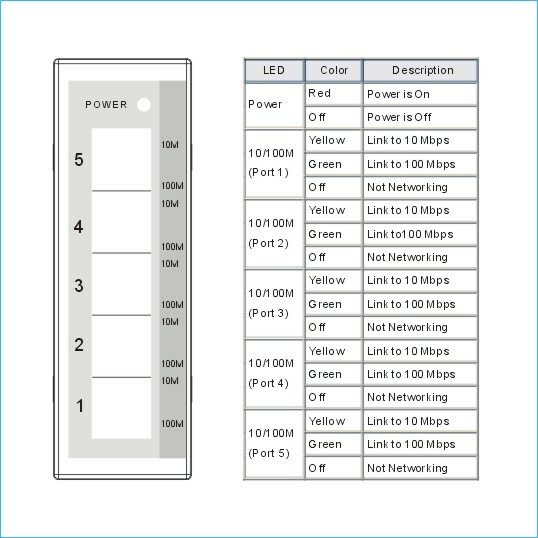 There is activity/link/data rate LED indicators for each port, which makes it easy to trouble-shoot. Port connectors are shielded RJ-45. It contains "soft start" function with overload protection and high-low voltage protection. The din rail mount allows it to be mounted on a din rail in control panels. The NS-205 is designed to operate in a wide range of temperatures to work in harsh industrial environment. ROBUST AND DURABLE: Can Be Used in Extreme Industrial Environments. Supports a Wide Range of Operating Temperatures from -40C ~ +75C (-40F ~ 167F). EASY TO MOUNT: Din Rail Mountable - Can Easily Fit in Control Panels. 0.1A@24VDC, +/- 5% arrowed with 10M Full duplex.